The big K and I woke up the next day to a wet and foggy Tagaytay morning. We could barely see anything outside. The whole place was blanketed in thick, cold fog. No mistake here, it was not smog (as what we are used to in Manila on a bad day!) but definitely a fog. It was a perfect start to the day sitting at Verbena's balcony waiting for our breakfast, sipping a nice cup of strong "barako" coffee while watching the heavy mist slowly clear up and reveal the lake and its volcano. 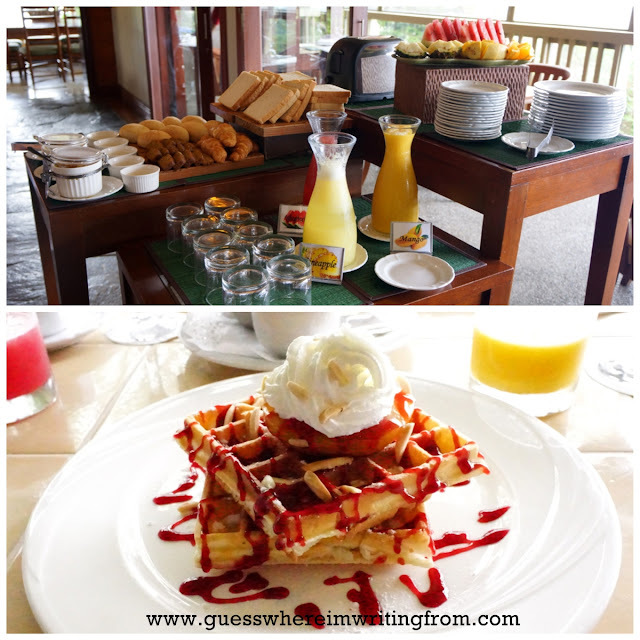 Our stay at the Discovery Country Suites included a complimentary breakfast menu of our choice plus a buffet of different breads, jams, fruits and juices. Montmartre is a district at the right bank of Paris on the outer arrondissement, the 18th arrondissement to be precise. The area gets its name from the 130-meter hill, the "Montmartre" translated into English means "mountain of the martyr". That martyr was Saint Denis, the Bishop of Paris from the third century, who lost his head. Literally. Our very first visit to the City of Lights was an unplanned one, side trip actually. The big K was picking up a brand new airplane from the Airbus factory in Toulouse. So, here I was riding shotgun again! Oh la la! C'est la vie! We only had a short time to prepare and plan for the trip. Since we were only visiting for the weekend we wanted to stay right at the city center where most of the tourist attractions are. Luckily we found a place that was affordable (good luck getting an inexpensive hotel in the middle of Fashion Week in Paris!). The hotel's location in the Latin Quarter was perfect. It was also right by an RER B stop, pretty convenient if you are coming straight from the airport. Below are some of the landmarks and attractions at the Latin Quarter and Saint-Germain-des-Pres that the big K and I were able to see on that very short visit. Jardin du Luxembourg, the second largest park in Paris is perfect for picnics.